FOURTEEN farmers and fisherfolk associations in Bago City have received P4.2 million worth of farm machineries and livelihood projects from the local government. Bago City Agriculturist Carlito Indencia, who was at the turnover ceremony at the City Agriculture Office at Barangay Balingasagon Thursday, December 13, said 16 units of various farm machineries were distributed to 10 farmers association-recipients including women’s groups. These are the Punta Playa Multi-Purpose Association, Mailum Organic Village Association, Barangay Napoles Women Association for Rural Improvement, Fermina Small Water Impounding System Association, Bago Integrated Farmers Association, Small Farmers Association of Abuanan, Dulao and Antipuluan, Newton-Camingawan-Para Farmers Association, Barangay Malingin Farmers Association, Association of Rice Farmers of Tabunan, and Sagasa Women’s Group. The equipment included one hand tractor, two threshers, one multi-tilling machine, three rice planting machines and five pumps with engines. Aside from farm machineries, they also received livelihood projects like balut making, food processing, salted egg making, and mushroom production. Four fisherfolk associations, meanwhile, including Taloc Baybay Fisherfolk Association, Calubay Anahaw Small Fishermen Association, Can-itum Integrated Fisherfolk Association and Barangay Calumangan Integrated Fisherfolk Association obtained alternative livelihood projects like fish vending, rag making, as well as cooking equipment and facilities. Indencia said the machineries and livelihood projects are funded by the city government, through its Agriculture Development Program. “The program covers the city’s measure to develop its rice and fishery sectors,” he said, adding that it also aims to provide farmers and fisherfolk alternative sources of income through its livelihood development component. Considered as the rice granary of Negros Occidental, Bago City’s contribution to the province’s total rice production is pegged at 19 percent, records of the City Agriculture Office showed. Banking on the program, the local government is pushing for increasing the production of rice farmers. The machineries are also seen to address their problems on lack of farm laborers. Indencia said the livelihood component of the program is positioned to enable the community, especially the women sector, generate income for their families instead of engaging in other activities like gambling. The city agriculturist pointed out that the machineries and equipment are given to the recipients for free on “conditional” basis. “They have to use the facilities base on the guidelines set, it should improve their productivity and profitability. Or else, it can be taken from them and given to other potential recipients,” he said, adding that associations can impose payments for their members at a minimal cost. It should result in the growth of both the associations and their members, Indencia also said. 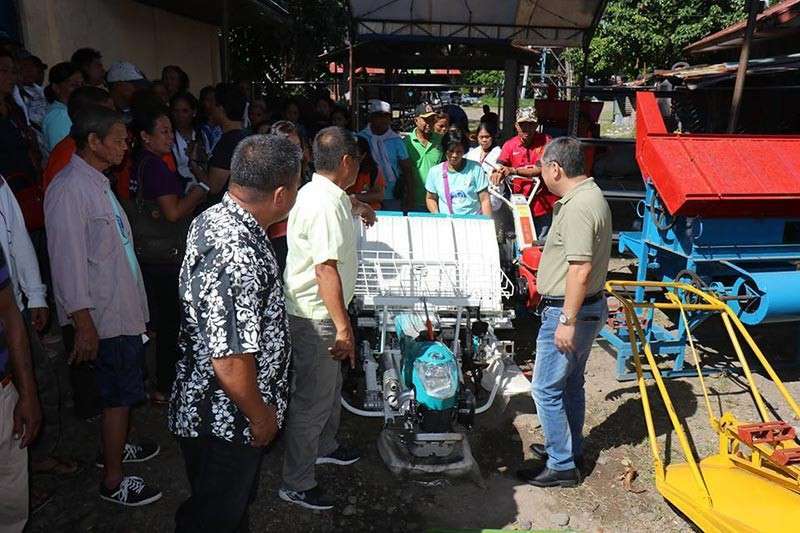 For his part, Mayor Nicholas Yulo, who led the activity, said they recognized the need to assist the farmers in terms of new farming equipment in order to attain rice industry development. Yulo said aside from subsidy on rice seeds, local farmers should be supported on mechanization especially amid the modernization in agriculture. He noted that as of November this year, the average rice yield in the city is 4.4 metric tons per hectare. This is higher than only 4.1 metric tons per hectare in 2017. Meanwhile, also present during the turnover ceremony were Fourth District Board Member Victor Javellana, who is the chairman of the Sangguniang Panlalawigan committee on agriculture, Vice Mayor Ramon Torres, and other members of the city council led by chairman of the committee on agriculture Councilor Femmy Alvarez-Martir.